It’s BATMAN ’66 WEEK — celebrating the 50th anniversary of the show’s final episode! For the complete index of features, click here. 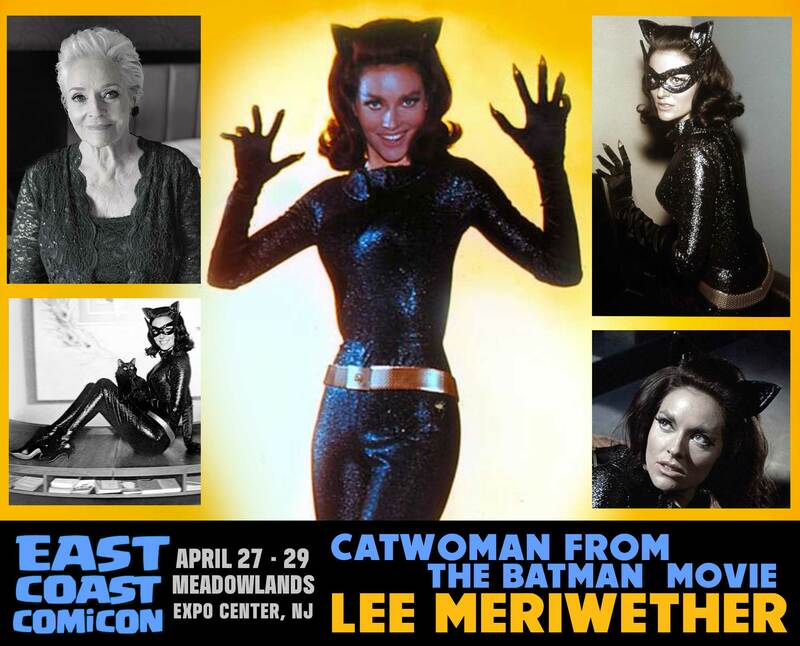 Here’s some purr-fectly wonderful news: Lee Meriwether, the 1966 Batman film’s very own Catwoman, will be attending East Coast Comicon next month. If you’ve never met Ms. Meriwether, you’re in for a treat. She’s warm and engaging and tells terrific stories of her time on Batman (plus Star Trek, The Time Tunnel and Barnaby Jones, to name just a few shows and movies). I’ll be hosting a panel with the erstwhille Miss Kitka and I’m very much looking forward to chatting with her at the show. And you should bring your questions, too, because we’ll be doing a Q&A. In addition to Ms. Meriwether, the show is shaping up to be another really good one. Other media guests include Micky Dolenz and the casts of Starsky & Hutch and The Warriors, among others. Comics pros include Jose Luis Garcia-Lopez, Roy Thomas, Howard Chaykin, Mike Zeck and plenty more. Tickets are on sale now: Click here for details. MORE: For the BATMAN ’66 WEEK Index of features, click here. I got to meet her last November in Milwaukee. She was so nice and took a photo with me and I got her autograph as well. Burt was also at the show and he was such a great guy also.